tering wavefunctions of the environment by decoupling (trapping) the remaining ones from the environment. In the Schrödinger equation, nonlinear terms appear in the neighborhood of the singular points. often near to the limit for single-particle (or alpha) decay. 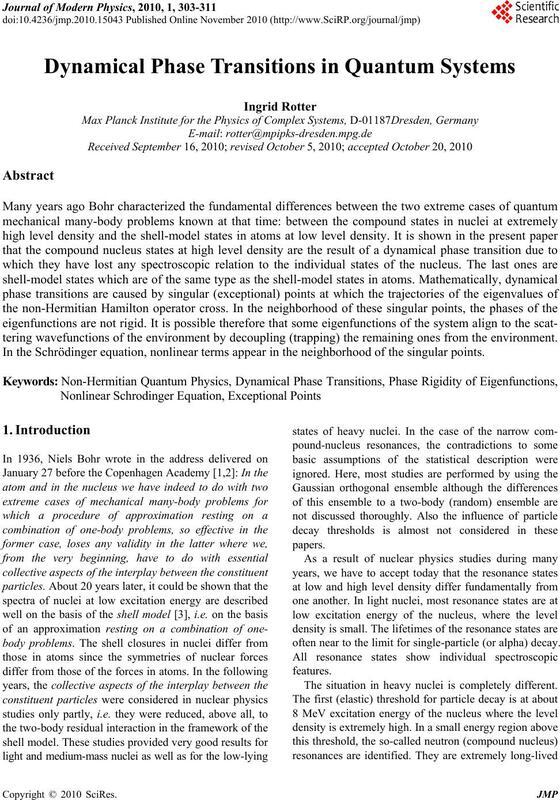 The situation in heavy nuclei is completely different. resonances are overlapped by one single-particle resonance. good description of this situation [8,9]. and to the narrow compound nucleus resonance states. coupled to the continuum only via the doorway states. isotopes by using the crystal blocking technique . play an important role in this transition. outlook is given in the last section. tum systems in a very clear manner. The two eigenvalue trajectories cross when =0Z, i.e. appear as double poles of theSmatrix. sense defined by Kato [1 3 ] . characteristic of neighboring resonance states. closer the crossing (exceptional) point is approached. system Bcan interact via the common environment C.
physics is able to describe environmentally induced effects. interesting feature of non-Hermitian quantum physics. seen from the Hamiltonian (3) or (17), see also [7,23]. in the regime of overlappin g re sonances. localized and show chaotic features. short-lived and long-lived resonance states are formed. regime of ove r l apping resonances [2 4, 2 5]. has been directly traced in this experiment. have almost nothing in common with shell model states. expected so-called mesoscopic behavior is observed, i.e. the phases are sensitive to details of the dot configuration. papers over many years, however without solving it. low level density show individual spectroscopic features. spectroscopic relation to the open decay channels (i.e. the spin swapping operation [31-34]. existence of an exceptional point. resonance trapping phe n omenon (width bifurcation). 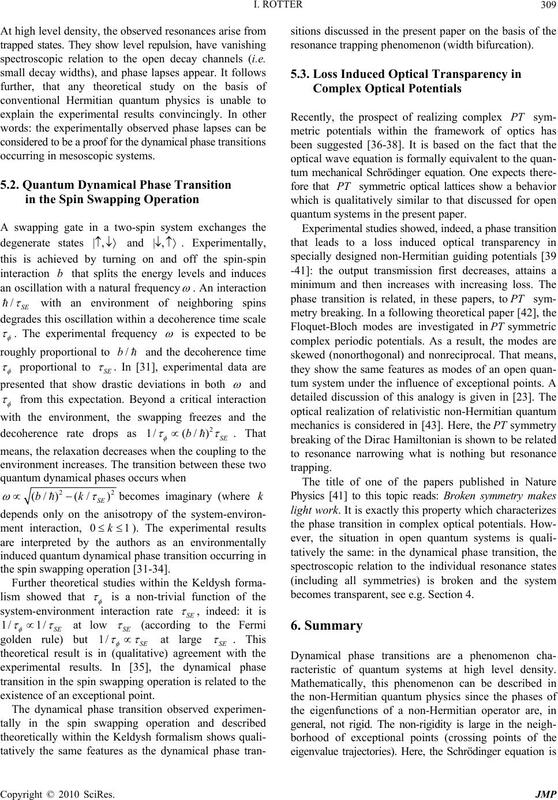 quantum systems in the present paper. becomes transparent, see e.g. 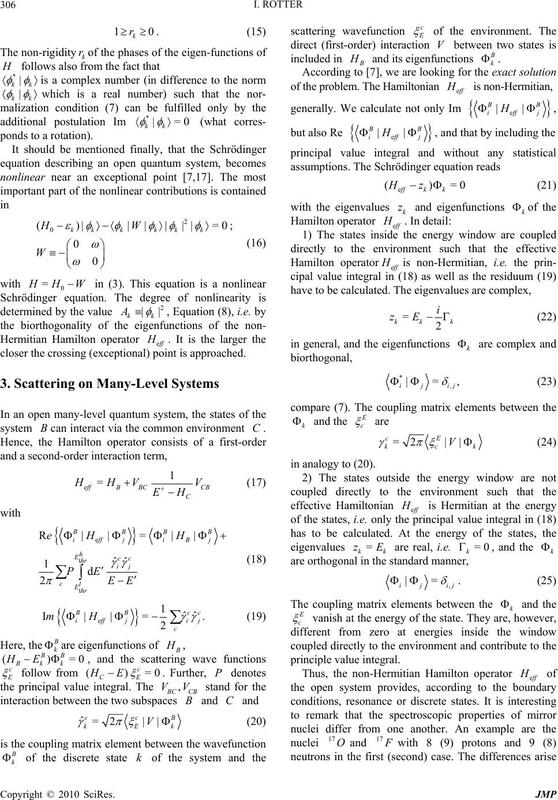 Section 4.
racteristic of quantum systems at high level density. the spectrum, the relation to a two-body random ensemble. region with many overlapping resonances. occur due to the existence of ex ceptional (crossing) p oi nt s.
Nature, Vol. 137, No. 3461, 1936, pp. 344-348. Die Naturwissenschaften, Vol. 24, 1936, pp. 241-245.
cal Review A, Vol. 45, No. 2, 1992, pp. 701-705. Vol. 220, No. 2, 1992, pp. 159-187. 1982, pp. 1086-1089(51 pages), and references therein. Annals of Physics, Vol. 5, No. 4, 1958, pp. 357-390. 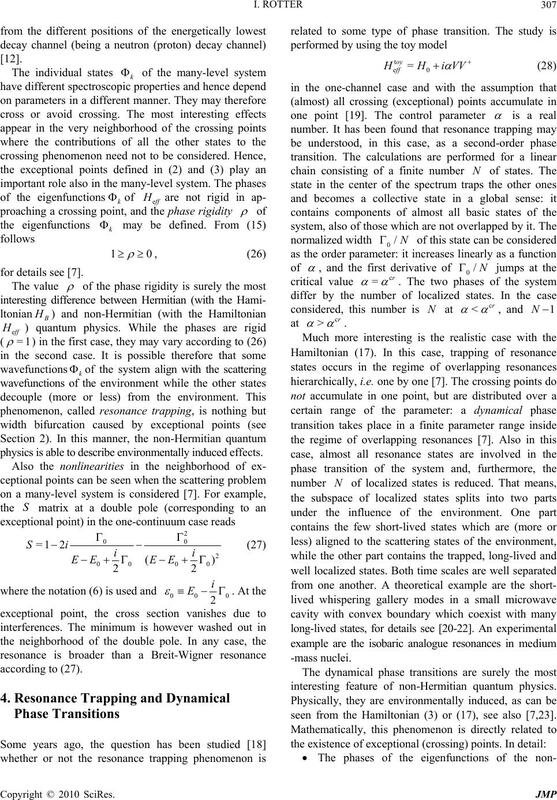 Annals of Physics, Vol. 19, No. 2, 1962, pp. 287-313. E. P. Kanter, D. Kollewe, K. Komaki, I. Leuca, G. M.
No. 3, 2009, p. 034619(7 pages). ics, Vol. 2, 19 32, p. 46. Proceedings of Royal Society, Series A, Vol. 137, No. 833, London, 1932, pp. 696-702.
Review E, Vol. 64, No. 3, 2001, p. 036213 (12 pages). No. 1, 1999, pp. 114-131.
tems,” Physical Review E, Vol. 58, No. 3, 1998, pp. Trajectories,” Physical Review B, Vol. 66, No. 8, 2002, p.
No. 24, 2002, p. 241302(R) (4 pages). of Optics, Vol. 12, No. 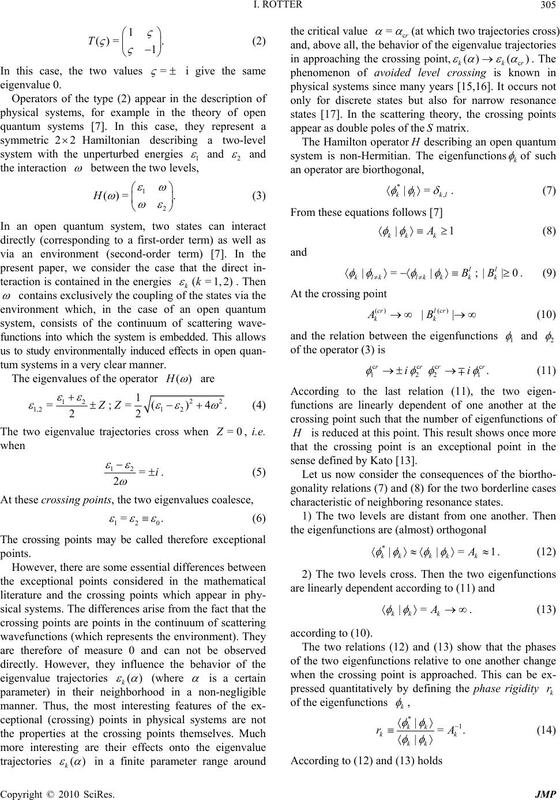 6, 2010, p. 065701 (9 pages). ergy Plane,” Physical Review E, Vol. 74, No. 5, 2006, p.
Regime,” Physical Review B, Vol. 76, No. 21, 2007, p.
Vol. 385, 1997, pp. 417-420. Dots,” Nature, Vol. 436, 2005, pp. 529-533. 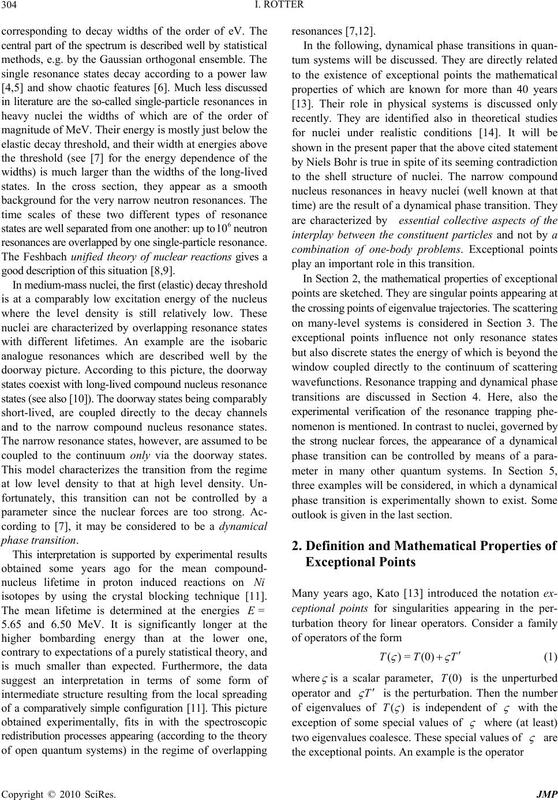 G. A. Alvarez, E. P. Danieli, P. R. Levstein and H. M.
Journal of Chemical Physics, Vol. 124, No. 19, 2006, p.
 E. P. Danieli, G. A. Alvarez, P. R. Levstein and H. M.
nications, Vol. 141, No. 7, 2007, pp. 422-426. Vol. 398, No. 2, 2007, pp. 438-441. Physica B, Vol. 398, No. 2, 2007, pp. 278-286.
the Fermi Golden Rule,” Physical Review A, Vol. 78, No. 6, 2008, p. 062116 (10 pages). 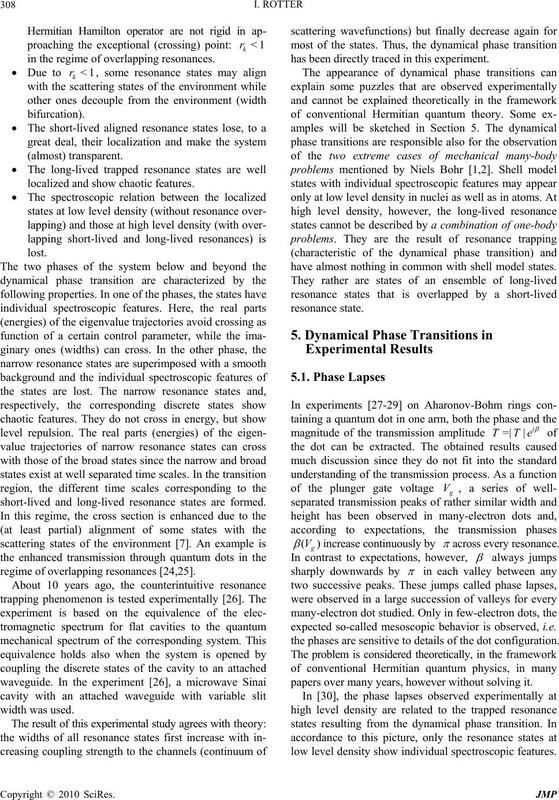 Structures,” Optics Letters, Vol. 32, No. 17, 2007, pp. 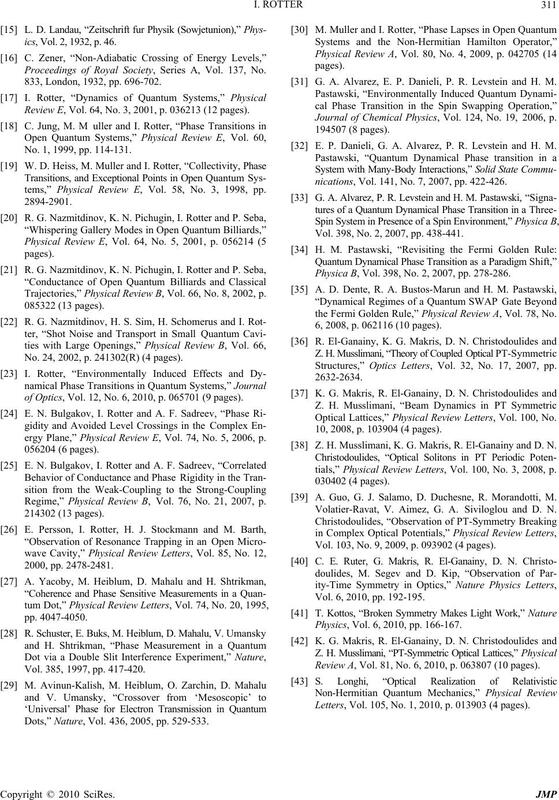 Optical Lattices,” Physical Review Letters, Vol. 100, No. 10, 2008, p. 103904 (4 pages). 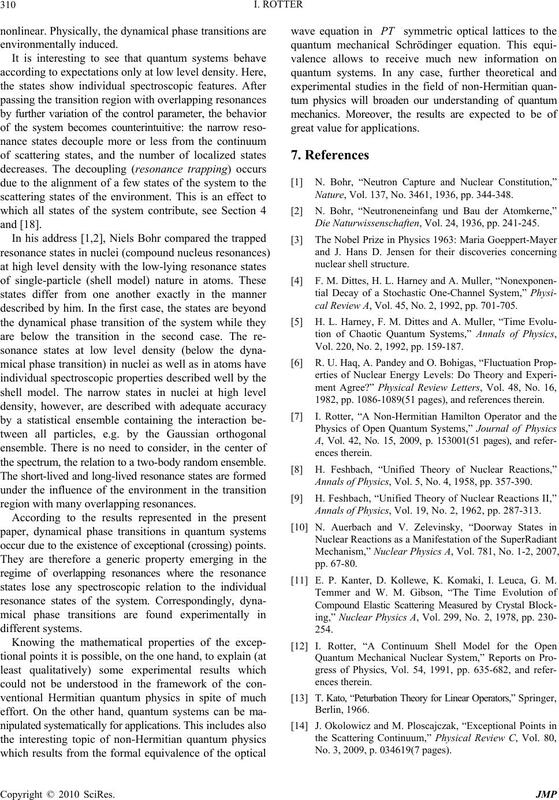 Z. H. Musslimani, K. G. Makris, R. El-Ganainy and D. N.
tials,” Physical Review Letters, Vol. 100, No. 3, 2008, p.
 A. Guo, G. J. Salamo, D. Duchesne, R. Morandotti, M.
Volatier-Ravat, V. Aimez, G. A. Siviloglou and D. N.
Vol. 103, No. 9, 2009, p. 093902 (4 pages). Vol. 6, 2010, pp. 192-195. Physics, Vol. 6, 2010, pp. 166-167.
Review A, Vol. 81, No. 6, 2010, p. 063807 (10 pages). Letters, Vol. 105, No. 1, 2010, p. 013903 (4 pages).